A severe thunderstorm outbreak is expected from Eastern Texas into Western Alabama Saturday. 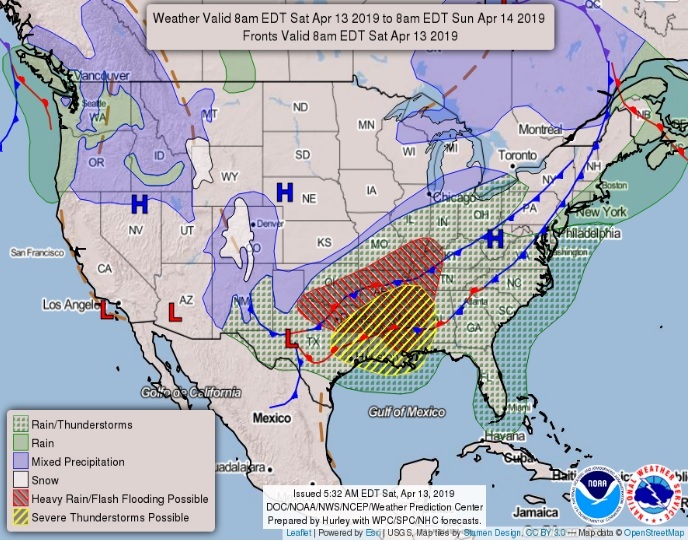 An active area of low pressure will develop across the Southern Plains Saturday and move northeastward across the Ohio Valley by Sunday. Severe thunderstorms are likely from East Texas across Arkansas, Louisiana, Mississippi, and Alabama on Saturday. A few strong tornadoes, damaging winds, and large hail will be possible. The threat then stretches from the Ohio Valley into the Southeast for Sunday. Storms across most of North and Central Texas will support a hail threat throughout today. The highest potential for severe thunderstorms will be southeast of a Temple to Athens line where a tornado or damaging wind threat may organize later this morning. There will also be heavy rain and flood potential for locales near and north of the US HWY 380 corridor. Thunderstorms are likely through this evening along and south of I-30. The most significant severe weather threat is expected to be during peak daytime heating this afternoon through this evening, mainly southeast of a Tyler to Camden, AR line. Tornadoes, large hail, and damaging winds are possible. Locally heavy rainfall may also lead to isolated flooding. Powerful non-thunderstorm winds will be possible during the afternoon and overnight hours. Northerly winds of 25-35 mph with gust to near 50 mph are possible, especially near and west of I-35. Thunderstorms may linger late tonight near and north of I-20 and could pose a hail threat. Additional storms are possible late Tuesday through Thursday. Spotter activation is likely this morning and into the early afternoon and evening across a good portion of North, Central, and Northeast Texas.